The only official Appalachian Trail Guide for thru-hikers and the champion of Appalachian Trail guides for long-distance hiking for a quarter-century! Still the only such guide written by volunteers for which all the proceeds are returned to the Trail by these two nonprofits! The Appalachian Trail Conservancy and the Appalachian Long Distance Hikers Association collaborate each year on a guide especially designed for potential thru-hikers who want the basic information for a five- to six-month trek in the woods, at a reasonable price, but also want the adventure of finding out the extras for themselves. A favorite of section-hikers, too. With fact-checking research by more than three dozen thru-hiker volunteers in 14 states, backed by the first-hand information of the trail's volunteer and staff maintainers and managers and extensive information from the 2019 Appalachian Trail Data Book. Equipment-makers' toll-free numbers, post office hours, much more is included. 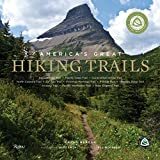 A hiker’s dream bucket list is embodied in this lavishly illustrated celebration of more than eighty of the world’s most iconic trails. 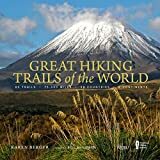 Celebrating the most important, popular, and diverse hiking trails in the world, this book invites readers to take a walking tour through the planet’s natural wonders. Divided into six sections, the book groups trails by theme: pilgrimages, historic hikes, mountain hikes, wilderness trails, trails through diverse environments, and long-distance trails. From Mount Kenya to subarctic hikes in Scandinavia, and from exotic hikes in the Himalayas to more familiar trails in the United States and Canada, this book invites readers to explore the history, environment, and cultures of the world on foot. Each featured trail has its own section, with a map and photo gallery focusing on what makes it one of the most magnificent hiking trails anywhere in the world. Included are detailed descriptions and trail highlights. This book is perfect for anyone interested in conservation, outdoor recreation, or the myriad ways that walking through a landscape is an intimate exploration of its soul. Whether you're a first-time backpacker, an occasional weekend warrior, or a seasoned long-distance trekker, this guide is a must for any backpacking, hiking, or camping trip. Supreme long-distance hiker Andrew Skurka—accomplished adventure athlete, speaker, guide, and writer—shares his knowledge in this essential guide to backpacking gear and skills. Skurka recounts what he's learned from more than 30,000 miles of long-distance hikes, including the Appalachian, Pacific Crest, and Continental Divide Trails, and the 4,700-mile Alaska-Yukon Expedition. A show-and-tell guide to clothing, footwear, backpacks, shelter and sleep systems, camp stoves, and more, as well as tips on foot care, campsite selection, and hiking efficiency, this single book contains all the knowledge you'll need to hit the trail. This second edition features 16 new pages (including food on the trail and other essentials), and updates all gear recommendations. With professionally crafted elevation profiles for all 2,190.9 miles, almost 50 updated maps, and redesigned tables for more at-a-glance information on-trail. With fact-checking research by more than three dozen thru-hiker volunteers in 14 states, backed by the first-hand information of the trail's volunteer and staff maintainers and managers and extensive information from the 2018 Appalachian Trail Data Book. Equipment-makers' toll-free numbers, post office hours, much more included. The leading guide for Appalachian Trail thru-hiking for two decades and still the only official guide. The Appalachian Long Distance Hikers Association's Appalachian Trail Thru-Hikers Companion offers up-to-the-minute knowledge of the A.T. from current hikers and Trail-maintainers more than three dozen volunteers giving back to current hikers and the Trail. It provides essential information on hiker-oriented services near the Trail. The Companion remains the only thru-hiking guide that reflects the perspectives of many and the only one produced by nonprofits that put the proceeds entirely back to the trail. ALDHA is the only organized A.T. users group. It compiles the Companion in collaboration with the Appalachian Trail Conservancy, the volunteer-based organization responsible for overseeing management of the trail. Together, they seek to make walking on the A.T. your adventure the adventure of a lifetime.